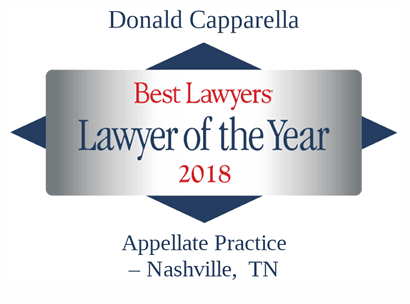 With more than 30 years of experience, Donald Capparella has established a reputation as one of Tennessee’s most respected litigators at both the trial and appellate levels. Individuals, businesses, and non-profit organizations trust him to vigorously represent their interests and get results. Mr. Capparella handles all manner of civil litigation throughout the state and federal courts. He has secured a landmark award for a widow and child wrongly denied insurance proceeds, and he is regularly called upon to handle complex matters including construction defects, business disputes, personal injury, and insurance matters.Highly regarded for his experience in tort litigation, Mr. Capparella has been counsel for many of Tennessee’s landmark cases over the last twenty-five years. He served as amicus counsel in McIntyre v. Balentine, which brought comparative fault to Tennessee. He was also counsel in the Tennessee Supreme Court case Jordan v. Baptist Three Rivers Hospital, that established loss of consortium damages in wrongful death actions, and Colin v. City of Savannah, which abolished the open and obvious rule. He was lead counsel in Martin v. Norfolk Southern Railroad Company, through which the Tennessee Supreme Court clarified the summary judgment standard in Tennessee. -Recognized as one of Tennessee’s preeminent appellate lawyers, Mr. Capparella has handled more than 200 appeals in state and federal courts. -In 2016, he was elected to membership in the American Academy of Appellate Lawyers. 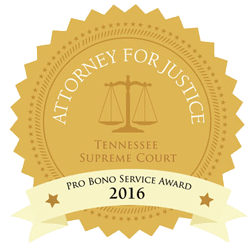 Named the Best Lawyers® 2018 Nashville Appellate Practice “Lawyer of the Year,” and the Best Lawyers® 2017 Nashville Insurance Law “Lawyer of the Year,” he leads the firm’s appellate practice team which manages civil, domestic, and criminal appeals throughout Tennessee. As a consultant, Mr. Capparella regularly assists trial practitioners, providing services ranging from trial court preparation, post trial motions, and handling of the entire appeal. 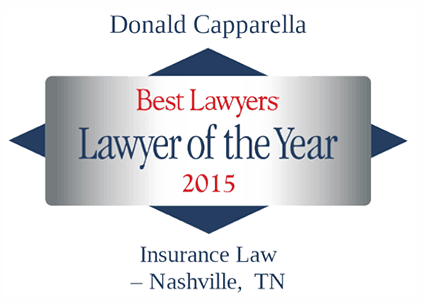 Mr. Capparella is a member of the Nashville and Tennessee Bar Associations and the Tennessee Association of Justice. 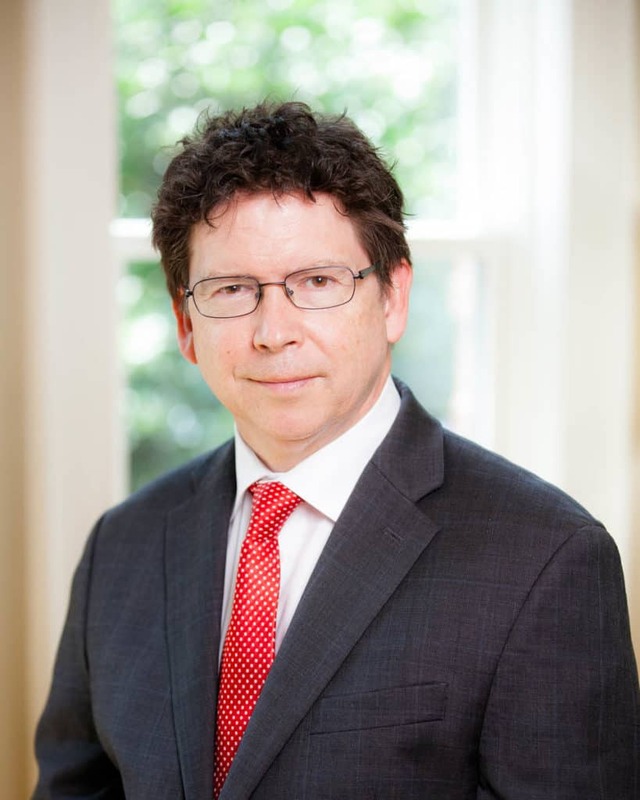 He has served as chair of the appellate practice committee of the Nashville Bar Association and was a barrister in the Nashville Chapter Harry Phillips American Inn of Court. 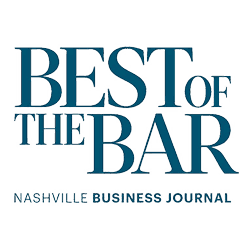 Mr. Capparella has been recognized by the Nashville Business Journal as “Best of the Bar,” as one of Business TN magazine’s “150 Best Lawyers,” and he has been named a Mid-South Super Lawyer. He has an AV® Peer Review Rating from Martindale-Hubbell. He also serves as the editor and contributing author for the Nashville Bar Association’s Appellate Practice Handbook. He is co-author of the Tennessee Law of Comparative Fault, published by Thomson Reuters. He has been an instructor of legal writing at Vanderbilt University School of Law and has taught advanced legal writing at the Nashville School of Law. For 25 years he served as an editor for the Tennessee Tort Law Letter, a monthly report of leading tort cases published by M. Lee Smith Publishers. Frequently in demand as a speaker, Mr. Capparella regularly leads continuing legal education seminars for organizations such as the Nashville and Tennessee Bar Associations. His popular “Much Ado About Ethics” seminar combines Shakespeare’s timeless works with modern legal ethical dilemmas, with proceeds benefiting the Nashville Shakespeare Festival. He has been selected by his peers for inclusion in Best Lawyers in America©, where, for the 2018 edition, he is listed in the fields of appellate practice, insurance law, and personal injury law. A passionate supporter of the arts, Mr. Capparella founded the Nashville Shakespeare Festival in 1988 and has remained actively involved as a director, actor, fundraiser and board chairman. The Festival provides professional theatre at no charge to more than 15,000 Tennesseans annually through its critically-acclaimed “Shakespeare in Centennial Park.” The Festival’s winter home is in residence at Belmont University, and the company tours throughout the year to schools across Tennessee. • McIntyre v. Ballentine, 833 S.W. 2d 52 (Tenn. 1992). Adoption of comparative fault. • Martin v. Norfolk S. Ry. Co., 271 S.W. 3d 76 (Tenn. 2008). Clarifying summary judgment jurisprudence. • Jordan v. Baptist Three Rivers Hosp., 984 S.W. 2d 593 (Tenn. 1999). Allowing loss of consortium damages in wrongful death case. • Colin v. City of Savannah, 966 S.W. 2d 34 (Tenn. 1998). Abolishing open and obvious rule. • TWB Architects, Inc. v. The Braxton, LLC, NO. M2017–00423–COA–R3–CV2018 WL 638251 (Tenn. Ct. App. Jan. 31, 2018). Obtaining nearly $1 million recovery for architect in dispute with developer. • Hammet v. Wells Fargo Bank , No. M2018-00352-COA-R3-CV (Tenn. Ct. App. Oct. 2, 2018). • Starlink Logistics, Inc. v. ACC, LLC, No. M2014-00362-COA-R3-CV (Tenn. Ct. App. Jan. 31, 2018). • United States v. Lanier, 870 F.3d 546, 547 (6th Cir. 2017). Successfully vacated criminal conviction for lack of Remmer hearing. • Moneypeny v. Kheiv, No. W2014–00656–COA–R3–CV, 2015 WL 1541333 (Tenn. Ct. App. Apr. 1, 2015). Trial & appellate counsel obtaining $1.3 million verdict for injured driver in car collision. • Russell v. Illinois Central Ry. Co.,No. 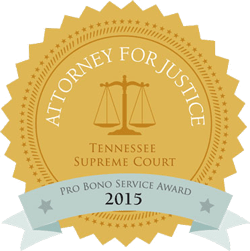 W2013–02453–COA–R3–CV, 2015 WL 4039982 (Tenn. Ct. App. June 30, 2015), perm. app. denied (Tenn. Nov. 25, 2015). Upheld over $3 million verdict for wrongful death of coworker. • In re Estate of Smallman, 398 S.W.3d 134 (Tenn. 2013). Secured new trial regarding widow’s right to pursue benefits of husband’s estate. • Mayfield v. Mayfield, 395 S.W.3d 108, 110 (Tenn. 2012). Reversing award of alimony to at-fault spouse. • Morrison v. Allen, 338 S.W.3d (Tenn. 2011). Securing $1.2 million judgment in life insurance action. • Exxon Mobil Corp. v. Fenelon, 76 Fed.Appx. 581 (6th Cir. July 30, 2003). Trial and appellate counsel for breach of contract case affirming verdict of $3 million. • Westmoreland v. Bacon, M2011-01811-COA-RMCV (Tenn. Ct. App. Feb. 26, 2013). Successful Supreme Court Application for Permission to Appeal resulting in remand and preservation of medical malpractice claim. • Downs ex. rel Downs v.Bush,263 S.W.3d 812 (Tenn. 2008). Reversing lower court grant of summary judgment in wrongful death claim and reinstating case for jury trial. • Phoenix Ins. Co. v. Estate of Ganier, 212 S.W.3d 270 (Tenn. Ct. App. 2006). Reinstating $1.3 million subrogation action, reversing trial court for second time on appeal. • Rusnak v. Phebus, M2007-01592-COA-R9-CV (Tenn. Ct. App. 2008). Reversing trial court and holding in case of first impression that pending partition action between joint tenants with right of survivorship is extinguished upon death of joint tenant. • Knight v. Metro. Gov’t of Nashville & Davidson Cnty., Tenn., 136 F. App’x 755, 757 (6th Cir. 2005). Affirming $200,000 jury verdict for plaintiff in discrimination case. • State v. Magness, 165 S.W.3d 300, 301 (Tenn. Crim. App. 2004). Substantially reducing defendant’s sentence on appeal. • Luna v. Sherwood, 208 S.W.3d 403, 404 (Tenn. Ct. App. 2006). 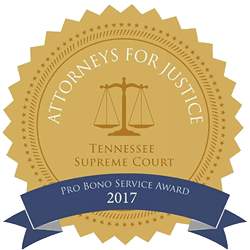 Preserving right to pursue medical malpractice claim in Davidson County, Tennessee and preventing adoption of intrastate forum non conveniens doctrine. Click here for information about this designation. The information found on this website is not intended as legal advice. You should not act on any information contained within the website without consulting legal counsel regarding your particular situation. We’re proud to call Nashville’s Historic Germantown Neighborhood our home. You’ll find us here 7:30am – 5:30 pm weekdays. Notice: Email is not secure and does not create an attorney-client relationship. Do not send sensitive or confidential information through attorney contact emails.